Courses are available Monday evenings from 5:30-7:30 pm from June 3 to July 1. Courses will be held at the NEW Branson/Lakes Area Chamber of Commerce building on Gretna Rd. in front of the Branson Meadows Mall. Exact address and room number will be provided as first class date nears. Courses are available at $10 per class or $45 for entire course. An evening meal is provided during each class at no additional cost. This course offering is made possible by a grant from the Ozark Workforce Development Board. Full course scholarships are available to anyone interested in attending all five weeks. Transportation is available for all course participants as needed. Please email Heather Hardinger to apply for a course scholarship or transportation. 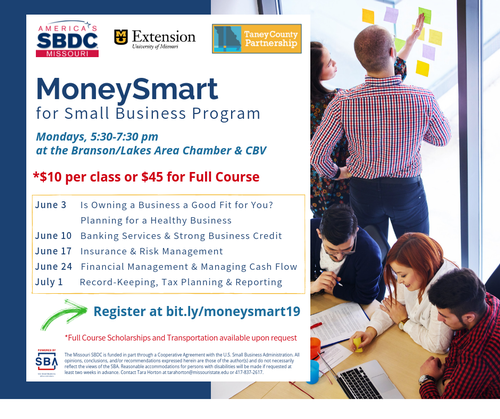 This five-week course offering will provide you with an overview of the critical first steps associated with starting a business. It is designed specifically for those who are thinking about a new business venture. Participants will assess their strengths and weaknesses in terms of business ownership, learn about the importance of planning, discuss legal and regulatory requirements and identify sources of funding. Identify resources that will assist you in starting a business in Missouri. Identify areas in which you need additional training or assistance for the operation of your business. Find out if business ownership is for you! This course is designed specifically for those who are thinking about starting a business. The course will examine the importance of planning, legal and regulatory requirements, and identify sources of financing. discussing the challenges of small business ownership. ​The Missouri SBDC is funded in part through a Cooperative Agreement with the U.S. Small Business Administration. All opinions, conclusions, and/or recommendations expressed herein are those of the author(s) and do not necessarily reflect the views of the SBA. Reasonable accommodations for persons with disabilities will be made if requested at least two weeks in advance. Contact Tara Horton at tarahorton@missouristate.edu or 417-837-2617.